Continuing with the Indian Author spree, I now completed the Banking Trilogy by Ravi Subramanian. I wonder if trilogy is actually the word here coz' I felt I was reading the same book thrice. 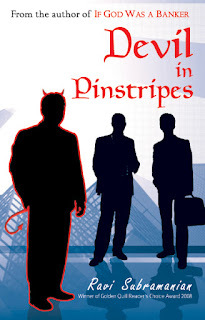 Not that I am complaining because I would have never gone for the third book - 'Devil in Pinstripes' after the second one - The Incredible Banker. (First being If God was a banker) The author makes carries forward the story line in a way, gripping enough to make you feel it is a fresh story though with a repeated background, which had to be similar to Ravi Subramanian's own years of experience of working in foreign banks operating in India. Though we keep blaming Chetan Bhagat for this but let's accept, the Indian Bollywood majorly affects our Indian writers. Here too, the book starts with a situation, a difficult one for a top notch corporate figure in a Bank and carries on in two different parallel timelines - one tracing back to the time the protagonist graduated & started with his career, his initial career, the friends/ enemies/ frenimies & mentors he made along & the other related to the events which unrelated to our hero, but led to make the situation where he is at this stage. Intriguing twists & turns while equally interesting characters which make the story complete bringing in the extra masala borrowed from Bollywood. me nunca puede dejar aparte..
que hace que mi corazón la calma..
un plan hermoso de mi destino..
más dulce que un sueño..